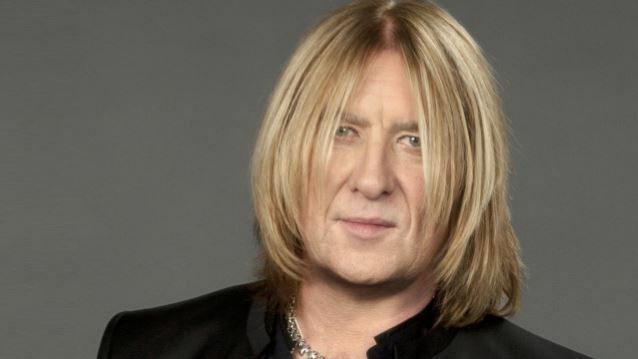 DEF LEPPARD singer Joe Elliott has a theory for how his band transcended the limited parameters of everyday hard rock and survived the countless musical trends that have come and gone. "With us, it's like pop rock, and I say that for all the best reasons, because we're a rock band and we've done pop hit singles," Elliott told the Bangor Daily News in a new interview. "At the peak of our power, we were rubbing shoulders with the likes of Janet and Michael Jackson, Prince, Madonna, Celine Dion. We were the sore thumb in the Top Five. I thought that was fantastic, because we were representing rock in a pop environment. That meant that our music was more accessible than most rock bands and that's because we were embracing more than rock," Elliott said. "Most rock bands just listen to rock music, but we were listening to everything from the BEACH BOYS to Kate Bush to Tom Waits to R&B and Motown. We grew up just liking songs. I think that's why we gravitated toward each other. We were never afraid to really like that song by JACKSON 5 or by Marvin Gaye… That's all part of why we are who we are." Elliott also talked about where DEF LEPPARD finds the inspiration to tour and make new music nearly forty years since the band's inception. "The fact that we've actually managed to stay together without beating the crap out of each other is miraculous," Elliott said. "We've had plenty of things put in our way. It gives you perspective. When your first guitarist is kind of sacked, or asked to leave, because he has an enormous drinking problem, your other guitarist eventually dies of [an addiction], and your drummer, in between, loses an arm… those kinds of things that would split lesser bands, or lesser incidents that would split even better bands — we don't really take them as seriously as most people would, because when you've had those obstacles, they kind of pull you together and give you perspective. We're really fortunate that we've been on the same page, pretty much every day since we've been together. We've wanted to be as positive and uplifting as we can and make music that makes people smile."